The way that we consume information on the Internet has changed dramatically over the years. The main reason is because there is simply more content available to us than we could ever consume during our time on Earth. Back in the day, our only options for news were newspapers and then eventually the local TV or radio station telling us what’s happening in our immediate area. 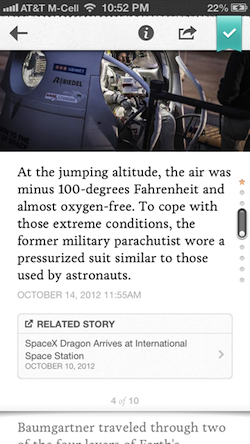 Circa has launched its iOS app today, and it aims to change the way that we consume and retain information. It’s a drastic approach, but it’s one that could actually work. We’re trying to make it so that people educate themselves for 5 minutes as opposed to play Angry Birds. At the time, I had no idea what Galligan meant, as his team has been heads down for the past six months building this new experience that was made specifically for mobile devices. Usually, companies will give you bits and pieces about what its working on, but Galligan has keep things pretty close to the vest. He told me that he’s actually surprised that the team was able to keep Circa and its project hush-hush, as that is certainly not the “Silicon Valley” way. Does Circa bring something new and awesome to the table? As a news junky, I can honestly say yes, yes it does. Here’s the typical experience of someone who reads news on their mobile phone: you see a link on Facebook or Twitter and you’re sent to a long mobile page, hopefully, and you’re then able to start reading. Galligan tells me that this experience is broken. Why? Because when you’re on a mobile device, you don’t really have the time to read an entire article, and you’re really looking to “snack” on the important bits and pieces about what’s going on in the world. I’ve been playing with Circa for the past few weeks and its this approach to “snacking” that stands out for me. When Galligan told us that you’d be reading news for five minutes instead of Angry Birds, he meant it. The company has a roster of editors and writers that will pick up on a hot story. 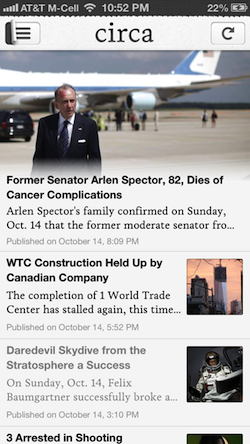 Once they have the story, they will chunk it up into important pieces within the app, which you can scroll through. We too are excited! RT @DJBentley I'm happy to announce that I am now a contributing editor @circa http://t.co/NtF8XqIF . As you go through a piece of news, you’ll find rich data like embedded maps, which will give you more context on what you’re reading about. In addition, the Circa staff points out sources for their stories, which you can then tap and go off into a different direction with. 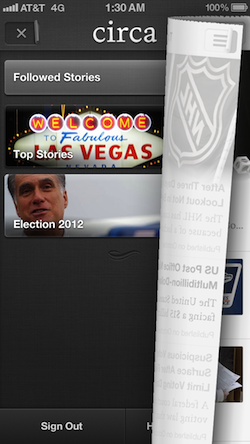 It’s kind of like a Choose Your Own Adventure, but with real world news. Since it’s so difficult to retain this much information, Circa allows you to follow the bits of news that you find interesting and will update you when there’s something new to report. You can go deep within a story to find your area of interest, and then follow that. The more I use the app, the more helpful it becomes. When you follow an item of interest, it’s really clutch to get a notification that there’s more to read. It’s almost as if Circa turns newsreading into a game, where you want to make sure you keep up with all of the latest developments. The way it stands now, I see an article I like while I’m on my iPhone and I use Pocket to check it out later, or favorite it on Twitter. It’s kind of a broken system, since it requires me to get in front of a computer to read the full article. 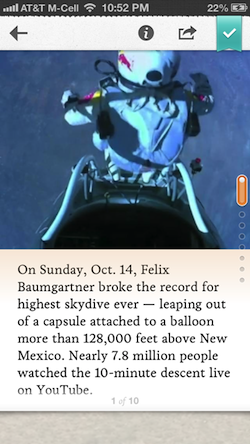 Circa turns that process on its head and the app is absolutely gorgeous, to boot. Galligan told me that the team just wanted to make an app that they wanted to use, something that would make them able to get the depth of information that Wikipedia provides, but at a pace that’s suitable for a mobile device like the iPhone or iPad. I’m pretty glad that Circa was heads down for the past six months, because the hard work has paid off. 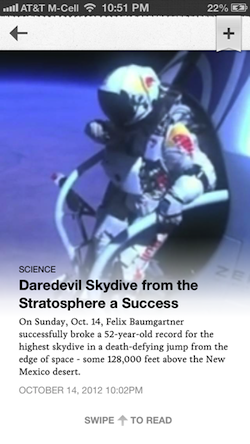 Will this type of rapid-fire, bite-sized news delivery start a new trend? Well, it’s something that’s already happening on Twitter. More often than not, I get breaking news on Twitter first, in 140 characters or less. Sometimes there’s a link to a full article, but sometimes it’s information that tells the whole story. For example, when there’s an earthquake in San Francisco, I follow an account that tells me when it was and how big it was. I don’t have to read anything further, I get the gist. What Circa is, is a hybrid of those two models, and I personally like it. During our sit-down, Galligan swiped through bits of news, showing me how fluid the experience is. This is obviously a labor of love for him and the Circa team, as well as an experience that nobody has ever tried before. When you get that combination at a small startup full of brilliant minds and talent, great things happen. Even though the app is just launching today, Galligan tells me that there might be opportunities to license its platform to other news organizations, and once you give Circa a spin, you’ll understand why. It’s more than app, it’s a platform of change. Circa brings the facts in a fantastic way, and its UI/UX is something that’s very new and nothing you’ve ever seen before. With the funding and backing that Circa has already, I would expect pretty awesome things from the team, even if it wants to keep things under wraps like Apple does. The app should be available shortly at this link. Excited to be revealing @Circa today. http://t.co/4RUXgBVl Still waiting for it to go live in the App Store. Stay tuned! UPDATE: The app is now available here. UPDATE 2: It looks like Circa has drawn a lot of attention and is making its way through some technical speedbumps. Hang tight.